Even though I can’t imagine the chat function of DS will be widely used in this day and age with so many better communication platforms available, I still felt like it was important to get it running for nostalgia’s sake if nothing else. 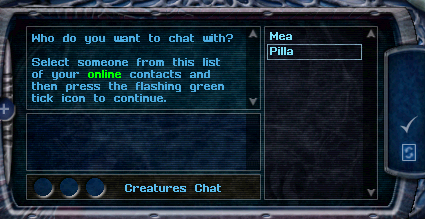 Chatting and group chatting with strangers via DS was how I met a lot of people in the community for the first time back in those days, and if nothing else I’d like to have the ability to relive those memories. Besides, from a completion standpoint, I wanted to make sure Albian Warp could be capable of everything that the old warp was. I had taken on a personal guideline for this project of making it work first, then optimizing and debugging later. Switching tasks frequently and not spending too much time on one thing was important to me to avoid getting too frustrated or burning out. I’m really grateful that all the testers were so patient with me while I flitted from task to task, probably working on everything but the most wanted features and annoying bugs. 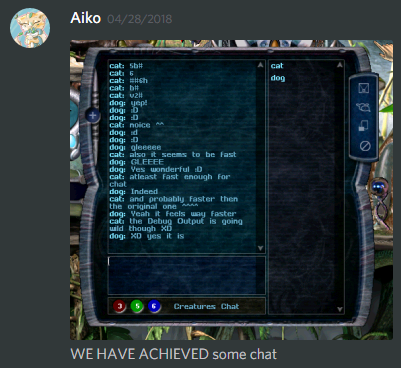 The chat code was quite something to untangle and translate, and it wasn’t until April 26th that I made some visible progress. The newest version of the client ham5ter developed included support for Real Time Direct Message Agents, or RTDMAs. Utilizing a websocket, these messages would be sent and recieved much faster than DMAs, making them perfect for chatting. 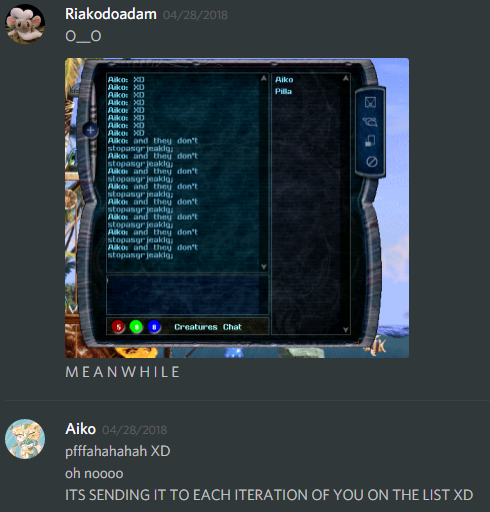 I couldn’t always bother someone else to test chat with me though, so the majority of my chat development was injecting fake RTDMAs to make sure the scripts were functioning properly. In short, I did a lot of talking to myself. The first actual live chat conversation on Albian Warp happened a few days later. It felt really nice! Too nice, in fact. 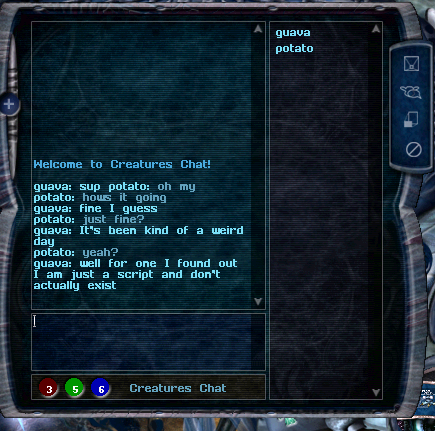 I had to overhaul a lot of the chat code in order to get this working, most of which I didn’t even fully understand, and I was expected to run into way more bugs than this. One on one chats worked so flawlessly that it was utterly unnerving. Ham5ter released the “Alpha Baboon” client, giving all alpha testers access to chat. Ham5ter, Pilla and Riakodoadam were awesome enough to hang around for several hours while we nailed down frustrating bug after frustrating bug, putting out updated scripts and burning and making new worlds like nothing else. 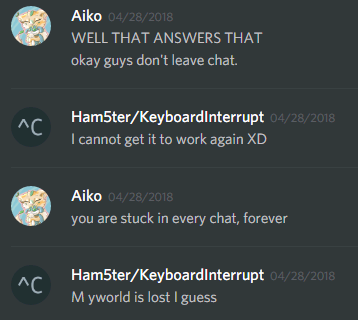 Even after a lot of effort and fixing a handful of problems, there were still a bunch of bugs with chat, particularly group chat. The invites wouldn’t send correctly, messages were only sending to part of the user list, messages went missing, and so on. I decided to take a break from working on chat a while and do some more general bug-fixing. Albian Warp is not associated or affiliated with, nor endorsed by BigBen Interactive, Fishing Cactus, or Gameware Development.